Here is the Poster that the Advertisement Committee and I created. We plan on hanging these up around campus to attract people to our showcase. We are currently in the process of creating a program to hand out at the showcase. We have come up with a few ideas for the Innovation section of the showcase. We are going to have a list of all of the innovations/inventions that Franklin created, and explain how all of these innovations have had such a detrimental impact on society today. We will then elaborate and demonstrate a few of these innovations and inventions, and give a little more background on each. Jason and Anna will be working on Franklin’s invention of swim flippers, and Briana and Megan will demonstrate and explain the significance of Franklin’s experiment with electricity. 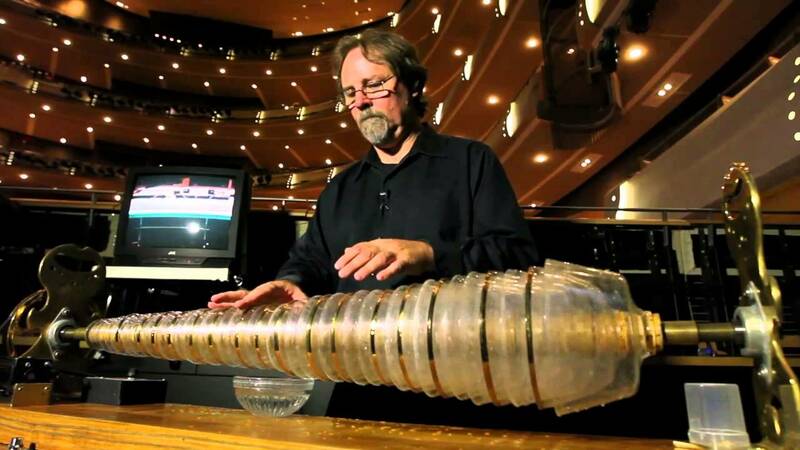 The invention I am focusing on is the Glass Armonica, one of Franklin’s favorite inventions. When Franklin invented the Glass Armonica in 1762, he was largely interested in music and attended concerts regularly. At one of these concerts, he saw a man perform a song on water tuned wineglasses. This made him wonder how he could make a musical instrument that would be far more convenient and take away the hassle of having to tune the water level every time, and thus, the Glass Armonica was born. Below is a picture of what the Glass Armonica looked like. The Glass Armonica is basically a bunch of horizontally stacked glass bowls of different width and thickness that are constantly spinning. The person playing the instrument must dip their fingers in water and touch the spinning glasses in order to produce sound. At first, this instrument was wildly popular. Even Mozart and Beethoven composed songs for the Glass Armonica. However its popularity quickly dies out, and today there are only about twelve Glass Armonica players worldwide. For the showcase, I plan on demonstrating how the Glass Armonica worked by playing the classic song, “Mary had a Little Lamb” on four glasses. I have already established the correct amounts of water needed. Franklin too had to experiment with the glasses to get the perfect pitch for each to ensure that he created a perfect musical scale that. Below is a clip of what I am going to be doing. Today we went all around Boston taking pictures for a surprise scavenger hunt that Professor Allison sent us on. Please click the link above to view our little adventure, along with all the pictures that we took on our long walk. We saw many sights and statues that we never knew existed and learned a lot about them. Although it was cold and wet (very wet), the scavenger hunt was an overall great experience. Although Franklin does love wine, here, he may be referring to the greatness of God and the wonders of the rain and the vineyards, rather than the greatness of wine. However, either way, the quote never had anything to do with beer. It is still unknown who started this rumor, or when his words got twisted since it it so hard to trace the roots to a rumor that started so long ago. However, according to beer.about.com/od/historyofbeer, the rumor may have spread so broadly because so many people commonly use the quote, and after hearing it so often, it is automatically is believed to be true. Also, since Franklin is known to have a satirical side to him, it would not be preposterous to believe that he may have said such a thing. However, today the false quote is still printed on-shirts all around the world. During the Enlightenment, people began to question why and how certain phenomenon occurred. Because there was no clear explanation, people automatically believed it to be the fate of god. Benjamin Franklin, being an enlightened thinker, began to experiment with electricity to try to better understand how exactly it worked. In class, we tried to model one of these experiments. 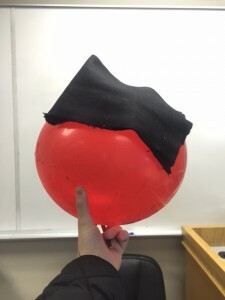 We blew up balloons and rubbed them with a wool cloth to generate electricity as seen in the image below. 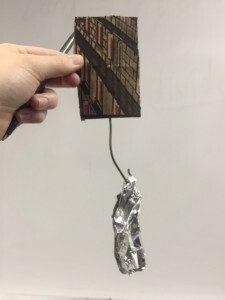 We then attached tinfoil to a meal wire and dangled it from a piece of cardboard. We tested to see if there was electricity generated by observing if the tinfoil would be attracted to the balloon or not. As we rubbed the balloon a strong negative charge built up and thus attracted the tin foil which was positively charged. Similarly, as we can see in his letters to Peter Collinson, Franklin would run experiments and write a clear description as to what he did and what materials he used and then try to draw conclusions to explain the phenomenon he witnessed. He ran experiments several times to try to prove his theories. Although it is not certain, it is thought that Benjamin Franklin write the essay, “The Witch Trial at Mount Holly”, which appeared in the Pennsylvania Gazette on October 22nd, 1730. The story begins with approximately 300 people gathered together to see the trial of two witches, a man and a women, whom have been accused of, “making their Neighbours Sheep dance in an uncommon Manner, and with causing Hogs to speak, and sing Psalms.” Denying the claims, the two accused witches agreed to undergo two tests to prove their innocence, only if two of their accusers would take the tests with them. The first test required the accused witches to stand on a scale where they would be weighed against the bible. The accusers believed “that if the Accused were weighed in Scales against a Bible, the Bible would prove too heavy for them”. Therefore, being lighter than the bible would prove that they were guilty. However then Franklin states, “Flesh and Bones came down plump, and outweighed that great good Book by abundance”. Since they were all found innocent, they had to forego the second test, in which the four “were bound Hand and Foot, and severally placed in the Water, lengthways, from the Side of a Barge or Flat, having for Security only a Rope about the Middle of each, which was held by some in the Flat”. If they sunk, they were innocent, and if they drowned, they were guilty. However, only the male accuser began to sink, while the two accused witches and the female accuser continued to float. The floating accuser claimed that “the Accused had bewitched her to make her so light, and that she would be duck’d again a Hundred Times, but she would duck the Devil out of her”. The accused male on the other hand stated, “If I am a Witch, it is more than I know”. However, after much consideration, the people decided that anyone would try to stay afloat and that perhaps it was the women’s clothing that made them stay above the water. Therefore, the trial was put off until the weather was warmer and they could try them all naked. Having lived in Massachusetts in his early life, perhaps Franklin was intrigued by the witch trials that were performed in Salem. Witch trials had not occurred in decades in North America, however they were very interesting to hear about. Franklin wrote this piece to simply entertain his readers in Philadelphia, however the story was later published in a newspaper in London, England. It could also be inferred that Franklin was making fun of the Puritan belief that people could be witches. He makes this apparent in the last paragraph where he states, “The more thinking Part of the Spectators were of Opinion, that any Person so bound and plac’d in the Water (unless they were mere Skin and Bones) would swim till their Breath was gone, and their Lungs fill’d with Water.” He makes it sound as if the people were finally coming to their senses, knowing that these trials were pointless and couldn’t prove anything. Many people in the 1730’s still believed in the concept of witchcraft, and here Franklin is showing that he thinks that this concept is simply preposterous. This satirical essay, may not have only made people giggle, but may have also played a role in shifting old beliefs. Though it is understandable that the writing and language of this essay is dated, due to the fact that it was written in the 1730’s, it was still quite difficult to understand exactly what was going on without using another source to explain what was happening. This may be because of the lack of paragraphs in the essay; as it is presented in one large paragraph with no separation. This made it difficult to pick on subject changes throughout the course of the essay. Another reason was due to the obvious differences in the English language that exists in older writing. The quotation: “A Sailor in the Flat jump’d out upon the Back of the Man accused, thinking to drive him down to the Bottom, but the Person bound, without any Help, came up some time before the other”, is a clear demonstration of how Franklin’s writing can sometimes be difficult to understand. Finally, another aspect of this essay that does not work to its advantage is that Franklin’s old type of humor is no longer relevant. Though this may be a matter of opinion to its readers, it is hard to relate to what Franklin is writing about in order for it to be humorous. If it were not for the translation source, it is difficult to even figure out that the story is fictional. However, it is believed that the Trial at Mount Holly never truly occurred. When Franklin was still working as an apprentice for his brother James in the printing shop, he knew that James would never publish a piece of writing that he wrote in the Courant. He therefore developed a pseudonym for himself under the name Silence Dogood, and tricked his brother into publishing his work. I will be examining the second essay that was published on April 16th, 1772. Silence Dogood was a woman whom began by describing her life story which continues into the second essay. She begins by stating that, “histories of lives are seldom entertaining, unless they are admirable or exemplar” and then explains that that her life is not all that interesting, so she doesn’t want to burden her readers with boring life stories. Therefore, instead she is going to give a brief summary of her life “in as few words as possible.” I believe that Franklin did this so that the reader understands that this piece of writing is not coming from anyone of importance, and was just for entertainment. This statement was rather ironic since later on Franklin’s life becomes extremely exemplar. However, Dogood then explains how her reverend asked her hand in marriage. At first, she states that she “burst out into an unmannerly laughter”. But she took the offer into consideration and accepted. Here, I think that Franklin was just trying to create an image for his readers, one that was entertaining and humorous. Many people were not happy about the engagement, however she said that he made her fall in love with him. She explains that their marriage was indeed a wonderful one. They had two daughters and one son. Sadly, after only seven years of marriage her husband faced an “inexorable, unrelenting death”. She wants to remarry, but finds that there are no suitable men. She explains how she now spends all of her free time in conversation with her neighbors, or writing letters. She finishes the second letter by giving her readers a sense of her character. When describing some of these characteristics, she states that she is “an enemy to vice, and a friend to virtue…a mortal enemy to arbitrary government and unlimited power… [and] jealous for the rights and liberties of my country”. I believe that although the majority of the story he has told so far is fictional, the characteristics he is describing here are describing himself. 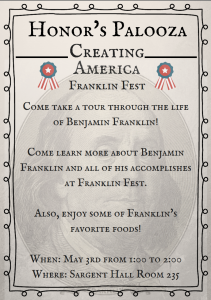 Franklin clearly demonstrates these characteristics, given that he was a major figure in the writing of the Declaration of Independence. Many of Franklin’s main points he is making are his own person and political views. Lastly, I think that it is possible that Franklin made up the biography not only to trick his brother into printing it, but also to make his readers feel a connection to Dogood before he continues with the rest of his essays. This statue of Benjamin Franklin was the first statue resurrected in Boston back in 1856, and was designed by Richard Saltonstall Greenough. It is located in front of the Old City Hall and stands eight feet tall. On all four sides of the statue are snapshots from Franklin’s life that depict some of his most important accomplishments. The snapshot on the front of the statue shows Franklin working in the print shop, where he was an apprentice to his brother. However, Franklin and his brother’s relationship eventually deteriorated causing him to move to Pennsylvania. On the back of the statue, is one of Franklin’s most important science experiments, where he is experimenting with electricity. Lastly, on the sides of the statue are snapshots of his involvement in the Treaty of Paris and the Declaration of Independence. Personally, I think that this is a beautiful statue that honors Franklin and all of his attributes to society. Even someone who has very little knowledge about his life, can learn a great deal about him by simply looking at this statue.